NPD’s Sports practice tracks point-of-sale (“POS”) market data of sports products for categories spanning outdoor, running, paddle and snow sports, cycling, and team sports. NPD’s U.S. POS sales tracking is derived from a panel of reporting retailers that represent more than 26,000 doors from sports specialty to mass merchants, as well as e-commerce. On a monthly basis throughout the snow sports season, SIA will deliver to its members a total snow sports industry view of apparel, accessories and equipment across alpine, snowboard and nordic at the top-line level. Its coverage will span the snow specialty, snow specialty e-commerce and sporting goods channels. There will be monthly topline retail sales reports for the season. There will also be more granular topline reports available in certain categories. Access is based on level of membership. “Today’s retail landscape is being reshaped, and having comprehensive retail data at our fingertips is more valuable than ever to understand what is happening, and how to act, in the marketplace. NPD’s coverage of retail and consumer trends paired with industry expertise across more than 20 industries gives retailers, brands and manufacturers a competitive advantage in making more informed and strategic business decisions. 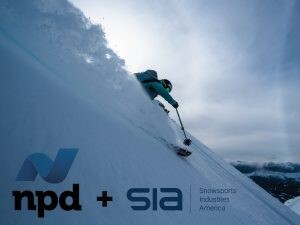 We are excited to partner with SIA in uncovering opportunities for the snow sports industry,” said Jim Kelley, President, Sports, The NPD Group. “As a supplier, it’s important to understand retail sell through results in a timely manner. These monthly reports will provide us with the year over year and month over month data and insights we need to gage how retail is performing in season. This data will be an integral tool in our current and future planning,” said Mike Adams, vice president at Amer Sports. For more information on monthly topline reports, as well as other available research products and pricing, additional data, and custom research, contact your SIA member services representative or reach out to NPD for more information on brand level and additional retail data products. *Reports to cover the following sales months: August and September combined, October, November, December, January, February and March.